This photograph is one of fifteen in the “Child, Bride, Mother” exposé “documenting the issue of Child marriage” in Guatemala. It is part of a larger transmedia project, “investigating: the world of prearranged child marriage,” by photojournalist Stephanie Sinclair entitled “Too Young to Wed” (Sinclair directs a non-profit organization by the same name). Sinclair’s “Child, Bride, Mother” communicates a sense of moral outrage over the marriage of girls who are under 18 in the rural Department of Petén, Guatemala. 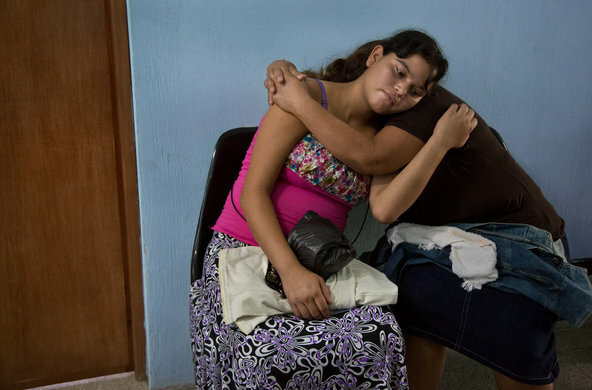 In the text accompanying her images, Sinclair describes these “underage brides” as traveling for hours “from the villages along the mud-soaked roads” and “parading endlessly through Petén’s hospital” to seek medical care. Sinclair characterizes the subjects of her photos as “physically immature and psychologically unready young mothers,” claiming these individuals are frequently abandoned by their husbands and left to raise their children alone. If viewed uncritically, this piece promotes an image of Guatemala where unknowing young girls are abused, impregnated, and abandoned by a society that does not care enough to adequately protect them. This discursive framing of Guatemala is gaining traction beyond Sinclair, and promotes a specific explanatory model with the potential to influence funding and policy priorities. Sinclair evokes a moral economy of childhood in which sin is ascribed to adults for allowing such abuses to befall young girls Fassin (2013), and blame is placed on local “cultures” viewed as deviant or defective (Poretti et al. 2014). These images of “child brides” exist within a framework often mobilized by child right’s advocates which normalizes childhood as a period of “innocence and happiness” and in order to produce “damaged children” as icons of victimhood (Poretti et al. 2014). The evocation of moral outrage and narratives of victimhood that surround the “child brides” of Guatemala obscure very real structural circumstances, such as inadequate access to healthcare, limited educational and employment opportunities, and massive land ownership disparities under which many rural and indigenous Guatemalans, young and old, live (Fisher and Benson 2006). Not only do these conditions create significant survival obstacles for the rural and indigenous families who attempt to live off of their milpas (small plots of land), but they are also largely responsible for the forced mobility of rural Guatemalan workers in search of alternate ways of supporting their families. Marion Carter (2002), who researches spousal support of maternal health in rural Guatemala, notes that the biggest impediment to spousal involvement is not “machismo” or patriarchal cultural norms—as Sinclair implies—but the absence of spouses due to forced migration. Sinclair treats the multiple factors impacting family survival decisions as inessential, but they are critical to understanding the context of the young women she is claiming to champion. Obscuring these factors promotes an understanding of the “child bride” phenomena in which deviant adult behaviour and “toxic” cultural norms take the blame while systemic failures and state responsibility is forgotten. Local culture is constructed as being in opposition to the “culture” of the rights of the child (Poretti et al. 2014; Rosen 2007), taking for granted a universal understanding of childhood that is imbedded in transnational politics, and indifferent to local context. Many of my recent experiences in Guatemala focus on access to health care in rural communities. It is only because of my research here that I recognize the circumstances Sinclair describes—walking hours to medical care, the high rates of maternal mortality—not as a phenomena specific to “child brides”, but rather as the deeply problematic lived reality for most rural Guatemalans. Without necessary contextualization, what meaning do the consumers of Sinclair’s piece leave with? To me, this raises very real concerns over the power of representation and issues of moral authority. Lisette: Briana, I definitely want to echo your concerns. As a PhD student in critical occupational science, I focus on human doing or “occupations” and how this “doing” influences people’s identity, health status and well-being. My interests lie in how political, cultural and socioeconomic factors affect people’s choices and possibilities to engage and participate in occupations that they want, need, or are expected to do within societies/communities. Born in Chile and currently working in Guatemala, I resent that young women are still portrayed as non-agentic and “poor” humans without a critical analysis of their context and acts of resilience, resistance or complex negotiations. In other words, Sinclair’s photos need context. Without knowing how girls take up, negotiate, or resist social issues such as a lack of opportunities or structural violence in rural areas of Guatemala, who are we to impose a Western-based ideal of childhood and motherhood as a natural and ethical conceptualizations for all collectives? What are the consequences for individuals and collectives who do not have the resources to live out these conceptualizations? (For more discussion about the “poor citizen,” the human right regime and global inequality, see e.g. Lister, 2009; Salomon, 2011). Overall, the representation of childhood in these photos makes me wonder: Why do we (outsiders) keep reproducing and maintaining a discourse about young girls as if they have failed the system, the country, or our own assumptions about childhood and womanhood? As you described above, these individuals are portrayed as “travelling for hours to seek medical care,” as if this situation was in some way related to the fact that they are young mothers rather than such travel being a common reality for women and men in rural areas such as in Petén, Guatemala. In other words, the social inequality and a lack of health services and resources have no relation to “underage brides” but to structural issues within Guatemala. Yet when presented uncritically, as Sinclair and others do (see e.g. CFR Info Guide Presentation, Tuschman reflections), the socio-historical issues that have marked out and shape the occupational possibilities (Laliberte Rudman, 2010) of young girls and women in Guatemala are easily and completely overlooked. The construct of occupational possibilities situates human action within a socio-historical context. This context facilitates and/or hinders our access to and possibilities for doing what we need, want, or are expected to do in society, as well as what we “should be” and “could be” doing. With her photos, Sinclair places the responsibility of action (being pregnant, married, etc.) within the individual (girls and their families), disregarding the larger social forces that promote, reinforce and maintain these ways of doing. In this way, Sinclair’s photos raise concerns regarding how young women are being portrayed in ways that individualize responsibility for “their doing”, obscuring the Western- neoliberal modes of governing that served to construct this image. Moreover, she used this governance to place responsibility not only on the individuals but also on us and our moral outrage asking us to “take action”- a problematization that enacts specific ways of power linked to specific modes of thinking (e.g. Western, Neoliberal, and individualistic notions of doing and responsibility, paternalism). In a critical analysis, these photos portray young women as immature, unready, abandoned, vulnerable, and without any capacity of choice or self-determination. But a closer consideration recognizes that these individuals are walking several hours to bring their kids to the hospital; they are taking care of their children in very complex contexts (some supported by their families, their husbands, or their husband’s families, as portrayed in the images). In this sense, how can we morally argue they are not doing what they should? I am aware of the abuse and abandonment that many of these young women (as well as other women, boys and men) experience. While I am not arguing that these situations do not deserve serious attention, my point in this piece is that these situations are not just about “child brides.” Portraying these individuals as “poor, immature girls” without a critical analysis of the social issues that are affecting the whole population of Guatemala reproduces and reifies a socially constructed image of girls as non-agentic social beings. It likewise ignores their acts of resilience and resistance. Along with these thoughts, I wonder: The young people are shown as alone and in rural areas in these pictures, some wearing Maya traje (traditional dress). What specific “type” of individuals are these pictures portraying? Who is missing in the photos? And what intersections between forms or systems of oppression are absent? Briana: Lisette, I so appreciate the questions your response raises, both with regards to issues of “western” conceptualizations of childhood and the intersectionality of the girls portrayed in the images. I think these two sets of questions are fundamentally related. This journalistic effort on “child brides” in Guatemala does not consider the diversity of the country; histories of colonialism; structural racism and discrimination against indigenous populations; and the Mayan worldviews that inform indigenous practices. It thus acts not as an exposé but as an erasure (see Grandin 2000). Many of the girls portrayed in the photos are wearing some form of indigenous clothing, but their indigeneity is never mentioned in Sinclair’s piece. This matters. Not only does it matter because of the above mentioned structural inequities—often including a fundamental lack of access to healthcare, education, and basic services—but it also matters because family structures in Mayan populations do not necessarily abide by “Western” conceptions of the adult/child divide. The global north has established a relatively arbitrary year in which adulthood starts—usually 18 years old. We have demarcated vulnerability as it fits with our cultural norms and practices, and then apply that to the rest of the world as though this conceptualization is a given. In speaking with a Kaqchikel Mayan woman recently (the Kaqchikel are one of the indigenous Maya people of the Midwestern highlands in Guatemala), she explained her understanding of adulthood and childhood in ways that were fundamentally different with those of the western world. She noted that adulthood was not about chronology, but about responsibility—responsibility to the family and community—and that youth were educated in the ways of their parents starting at an early age so that they could gradually take on more household responsibility, culminating in marriage, which would then become the indicator of their adulthood. This is not to say that there are no bounds, and in anthropology, we struggle to figure out what happens when local culture and human rights- (or child rights-) based discourses collide. The problem with the Sinclair piece is not that the marriage of young girls is never problematic, it is that we cannot assume that it is always so, as Sinclair implies. We must attend to the situated intersectionality of the girls, they are not just “child brides,” they are Guatemalan, rural, often indigenous, women. They are family members and community members who both frame and are framed by larger social structures and histories. You mention in your response that these young women are depicted as predominately alone. I am curious to hear your thoughts on this from an occupational perspective. What work do you think the journalist is doing by representing these young people as abandoned? In what ways are the occupational possibilities of the girls obscured through this photojournalism? Lisette: Mayan understandings of childhood/adulthood are based on the goal of “raising a child/person who will be able to sustain himself or herself economically and function as a competent member of the society” (Bazyk, Stalnaker, Llerena, Ekelman, & Bazyk, 2003: 274). In this way, children in Mayan communities socialize and develop within the context of their community; learning the work and duties of their parents and other family activities by observing, accompanying and participating in the work of others. In this way, according to diverse Mayan traditions, it is expected that in adolescence/early adulthood, girls and boys share in the responsibility of contributing to the household. Sinclair’s pictures do not portray the lived complexities of indigenous children and young adults. That the young women are frequently portrayed as solitary figures, abandoned, and sad draws my attention to the absented occupations. Their occupational potential is not described or exposed, completely obscuring the intersections that hinder their occupational possibilities. Girls rendered as “alone” are also indicative of the missing socio-cultural and occupational context (e.g. the activities that the girls are performing to care for their children, families and communities). In particular, a historical and cultural issue strongly related to marriage is missing: the conflict of land ownership (Viscidi, 2004; Lopez Mejia, 2006). As you mentioned earlier, in Guatemala, land ownership is an issue connected to great insecurity and instability for women and indigenous populations. Not only does Guatemala have one of the greatest land ownership disparities in the hemisphere, it also does not enforce basic protections for indigenous rights to land—and in particular the rights of indigenous women. Traditional inheritance practices have led to the further division of already small milpas, making subsistence farming increasingly difficult. Therefore, many families and young girls have chosen “marriage” as their only alternative to secure their family land and their daughters’ futures. This is not an issue of cultural “pathology,” but rather one of embodied structural violence. Conversations about “child brides” need to go beyond the stereotype of “poor and immature” girls/women if we really want to enable young women to access the resources and occupational possibilities that they need and want. Representations such as Sinclair’s are problematic not just for what they supposedly expose, but for what they naturalize and hide. Bazyk, S., Stalnaker, D., Llerena, M., Ekelman, B., & Bazyk, J. (2003) Play in Mayan children. American Journal of Occupational Therapy, 57, 273–283. Bluebond‐Langner, Myra., & Korbin, J. E. (2007). Challenges and Opportunities in the Anthropology of Childhoods: an introduction to “Children, Childhoods, and Childhood Studies”. American Anthropologist, 109(2), 241-246. Carter, M. (2002). Husbands and maternal health matters in rural Guatemala: wives’ reports on their spouses’ involvement in pregnancy and birth. Social Science & Medicine, 55(3), 437-450. Fassin, D. (2013). Children as Victims. When People Come First: Critical Studies in Global Health, 109. Fischer, E. F., & Benson, P. B. (2006). Broccoli and desire: global connections and Maya struggles in postwar Guatemala. Stanford University Press. Grandin, G. (2000). The blood of Guatemala: a history of race and nation. Duke University Press. Laliberte Rudman, D. (2010). Occupational possibilities. Journal of Occupational Science, 17(1), 55-59. Lopez Mejia, M.L., (2006) indigenous women and governance in Guatemala. The Canadian Foundation for the Americas (FOCAL). Poretti, M., Hanson, K., Darbellay, F., & Berchtold, A. (2014). The rise and fall of icons of ‘stolen childhood’since the adoption of the UN Convention on the Rights of the Child. Childhood, 21(1), 22-38. Rosen, D. M. (2007). Child soldiers, international humanitarian law, and the globalization of childhood. American anthropologist, 109(2), 296-306. Salomon, M. E. (2011). Why should it matter that others have more? Poverty, inequality, and the potential of international human rights law. Review of International Studies, 37, 2137–2155. Viscidi, L. (2004). A history of Land in Guatemala: Conflict and Hope for Reform. Americas Program, Interhemispheric Resource Center.